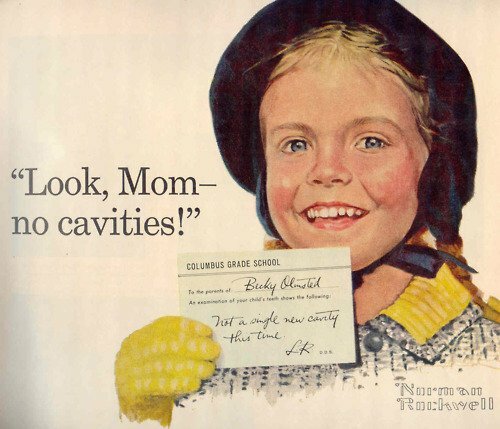 One of many famous 1958 ads for Crest by Norman Rockwell for the first fluoride toothpaste. Rockwell&apos;s ads and art played a particularly important role in advancing dental health and displayed other health-related topics as well - a subject we explore more in Art and advertising advances science and health: Norman Rockwell helped make toothpaste history. We use fluoride as a theme for a secret goal. Secret? Oooh, don't you love a good secret? Psst ... we'll let you in on it! Our secret goal is to get you excited and engaged in learning science, and to share that excitement with your friends, family, and co-workers. We do that by exploring the depth of understanding and knowledge we have about our world - using the lens of a single ion of a single element on the periodic table. An element that is the subject of a 65-year fight between science and pseudoscience. That ion is fluoride, and we aim to bring you fascinating graphics, fun videos, and good reading across all the subjects touched by this one little element. Chemistry. Biology. Biochemistry. Public health. Medical science. Dentistry. Nutrition. Here at FluorideExposed.org, we don't care whether you support fluoridation or not. We care whether you are learning more and more about science. We care about whether you can make your own decision based on clear evidence. We care about you being able to use the powerful tools and expertise of scientific thought to think for yourself. Are you ready? Ready to get the power of science straight to your inbox? F yeah, I science - sign me up! Fluoride reverses early tooth decay. In small amounts in water, fluoride helps teeth. In large amounts in air, fluoride is pollution. Fluorine is the periodic table element of fluoride. Fluoride is an anion of fluorine. That means it has one extra electron. Fluoride in well water can be too high. Join a community of science learners & get the latest updates from Fluoride Exposed.